Something Awesome wins the 2018 Charles Town Classic. Photo by Coady Photography. The chance to win tickets to Maryland Million Day has begun, the richest day in West Virginia racing is drawing near, and a unique racing oddity occurred during the week. The opportunity to win two VIP tickets to the 2019 Maryland Million Day at Laurel Park has emerged for the public. Those interested in participating in the chance to win are required to become a member of the Maryland Thoroughbred Club. Anyone who signs up to become a member during the month of April will be eligible to be selected as the winner. The chance to win free tickets to Maryland Million Day isn’t the only benefit that comes with joining the Maryland Thoroughbred Club. Membership to the club includes invitations to a variety of events, important information in the industry, free annual subscription to Mid-Atlantic Thoroughbred magazine, advertising discounts, and more. Charles Town Classic coming soon! 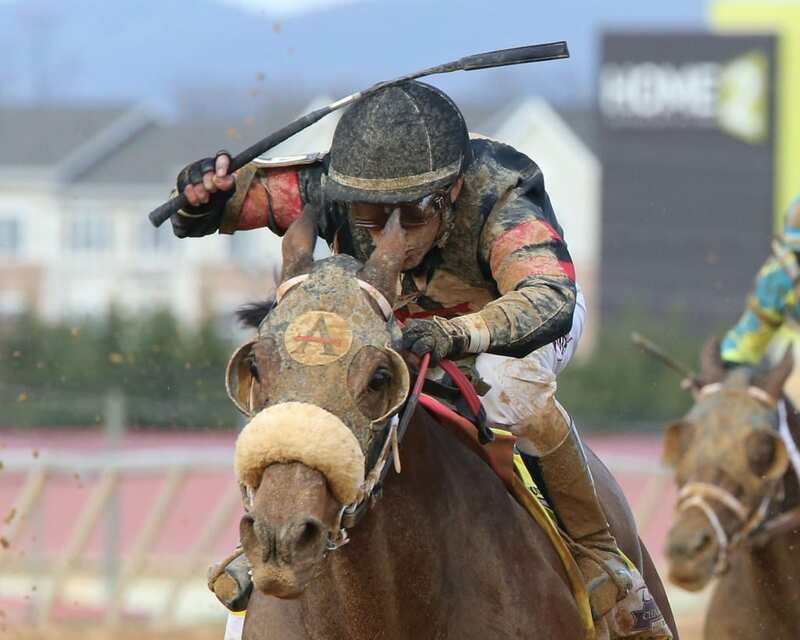 The richest day of racing in West Virginia is fast approaching, as the Grade 2, $1 million Charles Town Classic is set to take place on April 20th at Hollywood Casino at Charles Town Races. It will be a day packed with stakes action, fully equipped with a card of eight stakes races worth close to $1.5 million in purse money. In addition to the stakes action, the card for the Charles Town Classic will also include a $100,000 guaranteed Pick 4, as well as a mandatory Pick 6 payout. Post time for the first race on Charles Town Classic Day will kick off at 12:30 P.M. EST, with post time for the Classic itself coming at 5:37 P.M. The guaranteed Pick 4 is slated to begin at 4:29 P.M. and will span from Race 9 to Race 12. A fun racing oddity took place at Laurel Park over the weekend when the top three finishers of a race turned out to be sired by the same stallion. A $35,000 allowance race was run at the distance of 5 ½ furlongs on the dirt on April 7, with the win going to a gelding named, Confessor. The gelding was followed by Nico Bree N Teej and Hall Pass, who finished second and third, respectively. Oddly enough, each horse was sired by Freedom Child, who stands at Country Life Farm for a fee of $2,500. The race was completed in a final time of 1:03.86 over a fast track, with Confessor paying $9 to those who backed him with a $2-win bet. A $0.50 Trifecta for the Freedom Child progeny delivered a payout of $24.60 to their supporters.